Tonight I am making food. I started with bringing together some items from the bulk section of superstore. 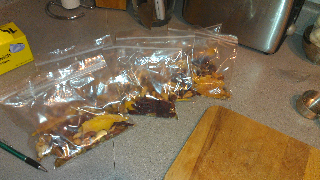 Cranberry trail mix, unsalted mixed nuts with no peanuts, and mango slices. I threw those into sandwich bags with some beef jerky. Now I have ten convenient snack packs. They are balanced @ 40% calories (roughly) from fat, 25% from protein and the remaining 35% from carbs. It makes for a fantastic addition to the day. I took the idea from Steve's Originals. I am waiting for my next order and I became a little eager.